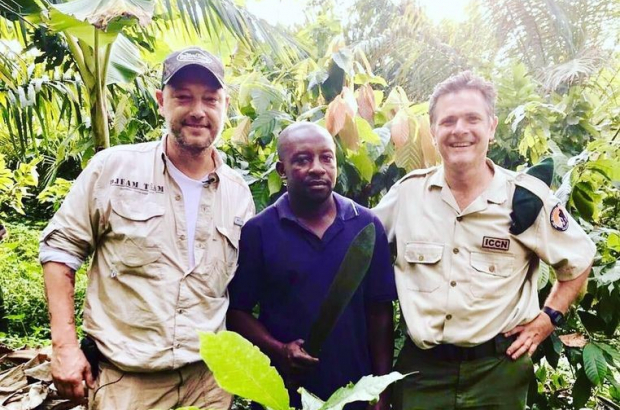 Bruges-based chocolatier Dominique Persoone has announced that he plans to build a chocolate manufacturing facility in the Democratic Republic of the Congo (DRC). Persoone, with a second Chocolate Line shop in Antwerp, is one of Europe’s most famous makers of pralines and other chocolate products. The factory will be built in the North Kivu province on the eastern edge of the DRC. The location near the Virunga National Park on the border with Uganda, is strategic and comes at the request of the park’s director, Emmanuel de Merode. De Merode, an anthropologist and conservationist, is part of the Belgian nobility but has lived in Africa for most of his life. The Virunga, a protected national wildlife park covering more than 8,000 square kilometres, has been the centre of armed conflict between rebel groups seeking to plunder its valuable resources for timber, charcoal and meat. As these armed militia sell the contraband to the local people – who have also been known to plunder the park in order to survive – de Merode would like to provide work for the locals. While the area is home to many cocoa bean farmers, the beans are processed and then sold at low prices to chocolate manufacturers abroad, which perpetuates the cycle of poverty. While Persoone is known for far-out praline flavours with ingredients that range from rice vinegar to beetroot, as well as quirky products like The Chocolate Shooter (powder that is snorted), the DRC factory will produce bar chocolate. “It will be worked by hand, with as few machines as possible,” he said. That way, more people can be put to work, but he also wants to maintain an artisanal character in the chocolate.